Please register with Barbara and send your deposit to her. Your pre-trip orientation will be with Barbara and her assistants. Barbara and participants will be staying at Pousada Jardim dos Anjos. Please register with John and send your deposit to him. 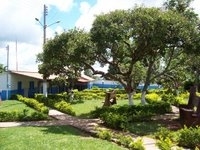 John and participants will be staying at Pousada Luz Divina. and adhere to the Standards of Guides. See this website for details. I have been going to The Casa with Barbara every winter since 2011. Five of those years she was my guide and in the last two years as her groups have grown I have been going as an assistant. After my first couple of times in Abadiania , I didn't really need a guide, per se. I knew how things moved around The Casa. But having Barbara's loving heart, compassionate understanding and guidance and her candor and openness about her own experiences has proved to be something I don't want to be in Abadiania without! The amazing people she attracts are as integral to the whole experience as Barbara and John of God! Barbara supports our intentions with Vipassana meditation and optional group sharing and of course Acai smoothies from Fruittis! She encourages a generous dose of quiet alone time as well for meditation, reflection and optimal healing. Vipassana Healing is highly recommended by me for a rich experience at The Casa de Dom Ignacio! The trip I took to the Casa has been a life changer. Like a meditation retreat or Monastery visit, I got away from everyday life to focus on healing and to deepen my awareness practice. Mostly I went with hopes to attend a chronic health condition and to continue my intention: "To see things as they really are." Support and Love permeate the atmosphere on the little street in Abadiania that is home to the Casa and many fellow humans striving to learn and heal. Barbara, Aaron, and their wonderful assistants create an important safety network. Issues arising have a clear place to land through interviews and casual conversation. Because the group was held so well, there was a lot of room for growth: a ground for expansion. This makes the whole experience a continual learning, healing, and heart-opening retreat. I cannot give a stronger recommendation. I have been to the casa many times prior to my most recent visit with Barbara. Barbara's support and guidance added such depth to the experience as to make it feel like the most powerful and meaningful I have had there. Time spent with the high vibration that the spiritual entities envelop us in allows many layers of healing to begin to unfurl. Barbara's help in the process gave me another level of understanding, perspective, and ability to work thru the issues that became manifest during my stay. I am deeply, deeply grateful for Barbara's ability, devotion, vision and wisdom in helping those in her care to move forward in growth and deeper healing of the body, mind and spirit. The words just aren't sufficient for me to express the magnitude of gratitude and reverence I have for her willingness to serve, and the profound depth of her very grounded love and understanding of the human condition. “Barbara understood my struggles and her insights helped me go to a much deeper level.